Frank Micelotta/Getty ImagesAmazon founder and CEO Jeff Bezos. Jeff Bezos‘ first letter to Amazon shareholders after the company went public in 1997 included a list of “important strategic partners” for the nascent online bookseller. The list included some of the biggest names in the 1990s internet boom like Yahoo, AOL, and Netscape. None of the companies on the list exist as independent entities today, while Amazon is one of the largest corporations in the world. 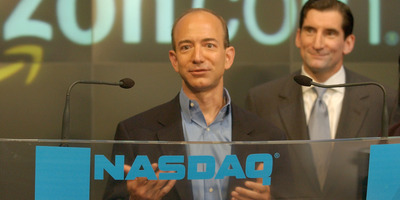 On Thursday, Markets Insider reported that Wall Streeters predict Amazon is poised to hit a $US1 trillion valuation. The internet has dramatically changed in the few decades of its existence, and a remark from an early Amazon shareholder letter provides an interesting view of just how many winners and losers the early tech boom created. Twenty-one years later, Amazon stands tall as one of the largest companies in the world, with a market capitalisation of around $US900 billion dollars as of Wednesday evening. Meanwhile, the eight strategic partners on Bezos’ list – all major players in the late 90s tech boom – no longer exist as independent entities, either going defunct in the years after the bubble burst or being acquired by other tech and telecommunications companies. America Online, the king of the dial-up internet era, famously bought Time Warner at the height of the tech bubble in 2000, then the largest merger in history, according to a retrospective from The New York Times. Nine years later, the struggling company spun off AOL. In 2015, Verizon bought AOL and now operates AOL under its Oath subsidiary. Yahoo was one of the biggest web portals in the 90s. In 2017, Yahoo joined AOL when Verizon acquired the company’s internet business for $US4.5 billion and placed it under the Oath subsidiary. Excitewas another popular web portal in the mid-90s. In 1999, Excite merged with another member of Bezos’ list, the high-speed internet provider @home. Unfortunately, the combined company was a casualty of the dot-com bubble’s popping, and the company filed for bankruptcy in 2001. Netscape published one of the most popular web browsers of the 1990s, and the predecessor to the Mozilla Firefox browser. In 2002, the company was purchased by America Online, and subsequently became a part of Verizon’s Oath subsidiary, where it remains today. GeoCities was a popular early web-hosting service. GeoCities was purchased by Yahoo in 1999, and then shut down a decade later. AltaVista was an early search engine. After a series of deals during and after the dot-com bubble, AltaVista ended up being purchased by Yahoo in 2003. Yahoo shut the service down in 2013. @Home was a high-speed internet service provider in the 1990s. As mentioned above, the company merged with Excite, but then went bankrupt amid the dot-com bubble popping in 2001. Prodigy was an early internet service provider and competitor with America Online. In 2001, Prodigy was acquired by SBC Communications (now AT&T). 1990s amazon aol clusterstock jeff bezos netscape sai warroom-us yahoo!